Practical Electronics for Inventors gives you information you need, in a format you can work with. The simple step-by-step approach teaches the fundamentals in a way that requires no background in electronics. 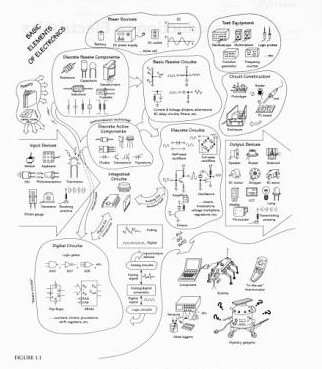 Packed with illustrations, the 750 hand-drawn images provide clear, detailed instructions on how to turn theoretical ideas into working real-life gadgets. This crystal-clear, learn-as-you-go guide shows you what a particular device does, what it looks like, how it compares with similar devices, and how it is used in applications. Written by Paul Scherz, a physicist who is also an inventor and electrical hobbyist, this important reference provides beginning hobbyists and inventors with an intuitive grasp of the theoretical and practical aspects of electronics--just the kind of insight you need to get your projects up and running. Starting with a light review of electronics history, physics, and math, the book provides an easy-to-understand overview of all major electronic elements. Along with coverage of integrated circuits (ICs), digital electronics, microcontrollers, and various input/output devices, Practical Electronics for Inventors takes you through reading schematics; building and testing prototypes; purchasing electronic components; and safe work practices. You'll find all this--and more--in the guide that's destined to spur you on to new levels of creativity. Perhaps the most common predicament a newcomer faces when learning electronics is figuring out exactly what it is he or she must learn. What topics are worth covering, and in which general order should they be covered? A good starting point to get a sense of what is important to learn and in what general order is presented in the flowchart in Fig. 1.1. This chart provides an overview of the basic elements that go into designing practical electrical gadgets and represents the information you will find in this book. The following paragraphs describe these basic elements in detail. At the top of the chart comes the theory. This involves learning about voltage, current, resistance, capacitance, inductance, and various laws and theorems that help predict the size and direction of voltages and currents within circuits. As you learn the basic theory, you will be introduced to basic passive components such as resistors, capacitors, inductors, and transformers. Next down the line comes discrete passive circuits. Discrete passive circuits include current-limiting networks, voltage dividers, filter circuits, attenuators, and so on. These simple circuits, by themselves, are not very interesting, but they are vital ingredients in more complex circuits. After you have learned about passive components and circuits, you move on to discrete active devices, which are built from semiconductor materials. These devices consist mainly of diodes (one-way current-flow gates), transistors (electrically controlled switches /amplifiers), and thyristors (electrically controlled switches only). Once you have covered the discrete active devices, you move onto discrete active/passive circuits. Some of these circuits include rectifiers (ac-to-dc converters), amplifiers, oscillators, modulators, mixers, and voltage regulators. This is where things start getting interesting. To make things easier on the circuit designer, manufacturers have created integrated circuits (ICs) that contain discrete circuits-like the ones mentioned in the last paragraph-that are crammed onto a tiny chip of silicon. The chip usually is housed within a plastic package, where tiny internal wires link the chip to external metal terminals. Integrated circuits such as amplifiers and voltage regulators are referred to as analog devices, which means that they respond to and produce signals of varying degrees of voltage. (This is unlike digital ICs, which work with only two voltage levels.) Becoming familiar with integrated circuits is a necessity for any practical circuit designer. Digital electronics comes next. Digital circuits work with only two voltage states, high (e.g., 5 V) or low (e.g., 0 V). The reason for having only two voltage states has to do with the ease of data (numbers, symbols, control information) processing and storage. The process of encoding information into signals that digital circuits can use involves combining bits (1 's and 0's, equivalent to high and low voltages) into discrete-meaning "words." The designer dictates what these words will mean to a specific circuit. Unlike analog electronics, digital electronics uses a whole new set of components, which at the heart are all integrated in form. A huge number of specialized ICs are used in digital electronics. Some of these ICs are designed to perform logical operations on input information, others are designed to count, while still others are designed to store information that can be retrieved later on. Digital ICs include logic gates, flip-flops, shift registers, counters, memories, processors, and the like. Digital circuits are what give electrical gadgets "brains." In order for digital circuits to interact with analog circuits, special analog-to-digital (A/D) conversion circuits are needed to convert analog signals into special strings of 1's and 0's. Likewise, digital-to-analog conversion circuits are used to convert strings of 1's and 0's into analog signals.